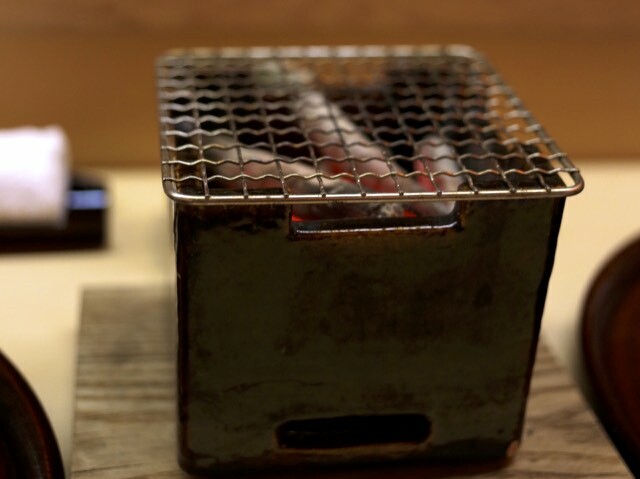 There’s a reason why Tadayoshi Matsukawa’s restaurant in Akasaka, Tokyo is considered, amongst the gourmands in the know, the best in the city, and possibly the country… but he isn’t about to let anyone come into his restaurant to find out why. As an invitation-only restaurant, getting a reservation at this 22 seater is no easy feat. The lunch sitting however does seem to be somewhat less challenging than dinner. 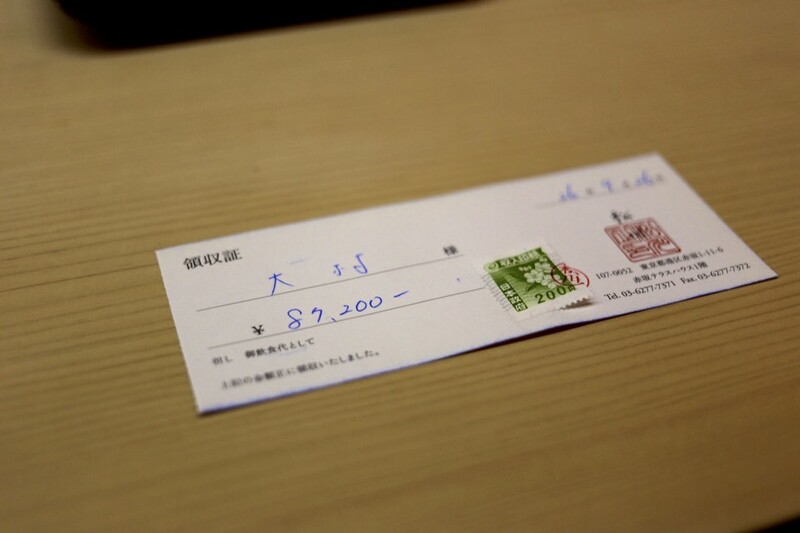 There’s also another catch with the restaurant: it’s cash only and, given a meal here sans alcohol will knock you back at least 35,000 yen a head (or more during matsutake season as we discovered the hard way), make sure you bring a wad of cash with you. 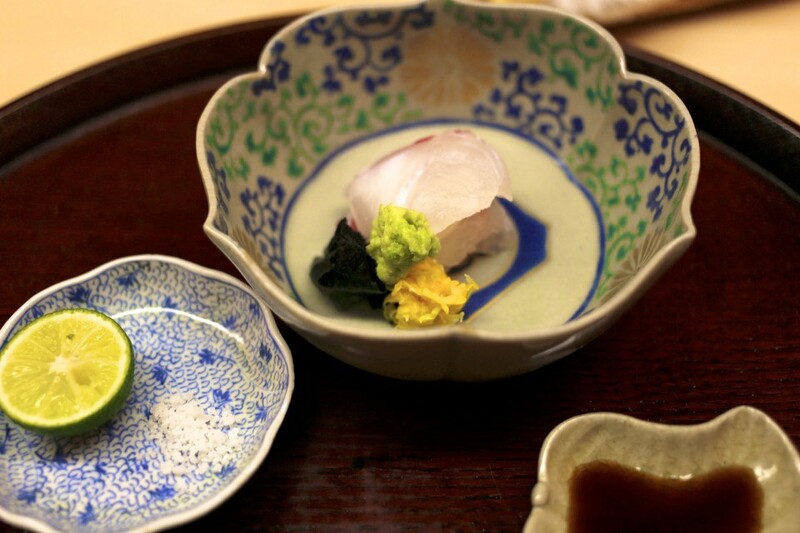 Trained classically in traditional Japanese cuisine at the two starred Seisoka in Minato-ku, Chef Matsukawa is renowned for creating phenomenal dishes from the freshest ingredients chosen personally by him every day. 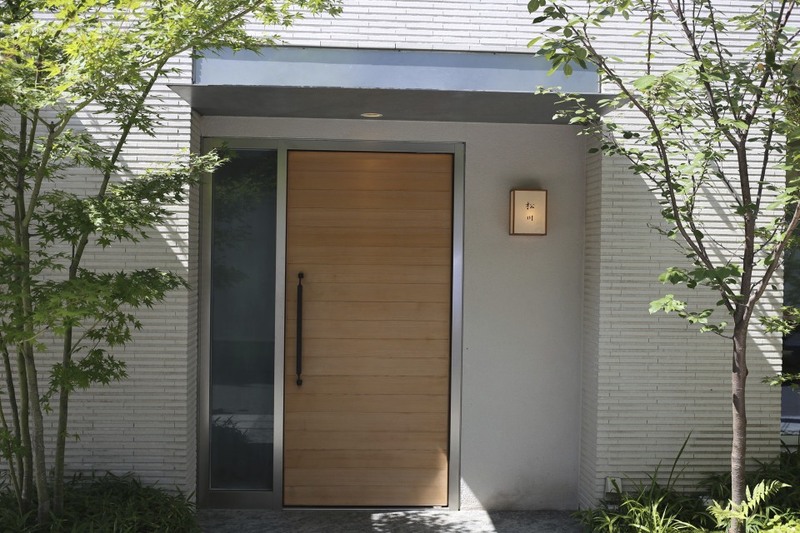 He is equally well known for being very shy from any publicity, perhaps explaining why this restaurant has evaded the red Michelin book to date. After all, why would you want to attract every man and his dog when you already have a steady clientele of the well connected and aristocrats? 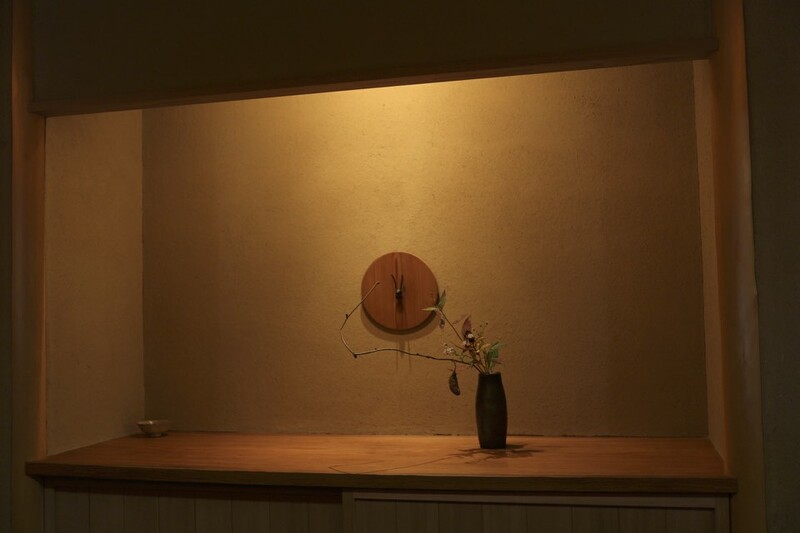 There’s no menu per se at Matsukawa – everyone gets 10 courses of the best ingredients he has chosen that day, give or take some substitutions for any allergies. 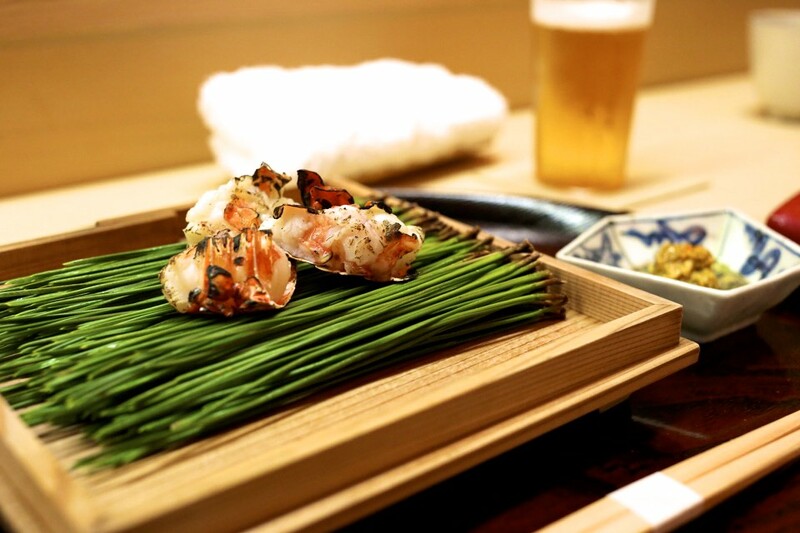 1st Course – Japanese spiny lobster / Ise-ebi (伊勢海老): Our meal truly commenced with a feast for all senses. We could smell the ise-ebi being grilled very lightly over white coal (binchotan) before it was served on a bed of pine needles. The delicate and juicy tail meat was served with the sweet meat of the head/brain and ponzu to add some freshness. A beautifully balanced dish that was flawlessly executed. It was also the best preparation of ise-ebi I have had to date. 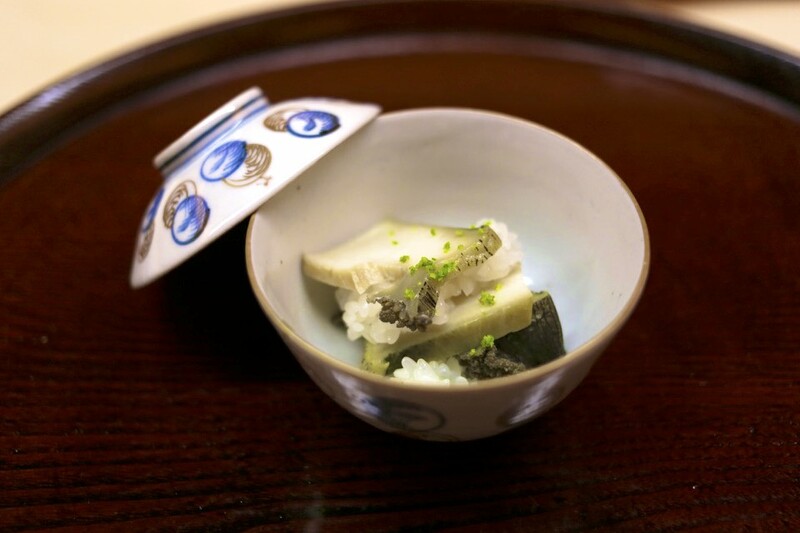 2nd Course – Rice Steamed Abalone / Awabi no imushi (鮑の飯蒸し): Generously thick but tender and juicy abalone served over mochi-gome (glutinous rice) that had soaked up the flavours of the ocean. The chef utilised the natural flavours of the ocean to season the dish and a zest of Japanese citrus sudachi to cut through the rich meat. Another simple looking but delicious dish. 3rd Course – Simmered dish of Red snow crab and matsutake / Benizuwaigani to matsutake no nimono (紅ずわい蟹と松茸の煮物): We had noticed that the chef had literally a mountain of matsutake from Saitama piled over the counter and wondered when he was going to use it – this was it. 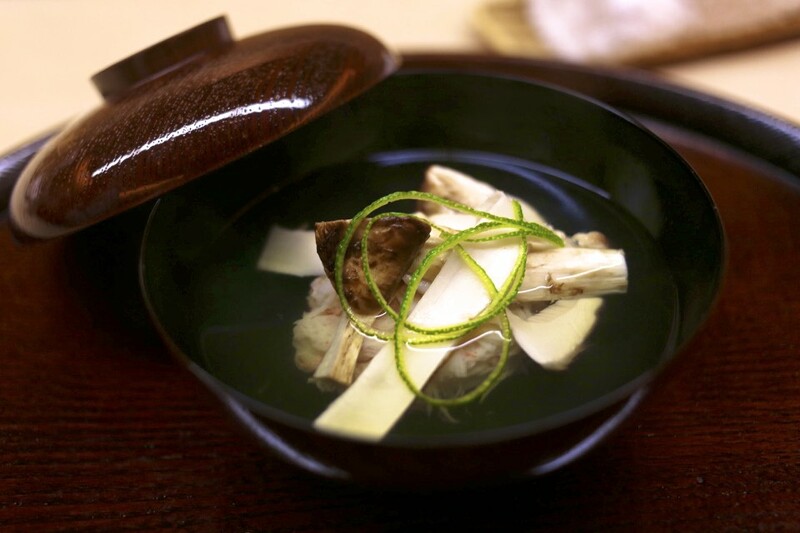 The sweet simmered crab meat was served in a clean broth with a few slithers of matsutake, topped off again with sudachi rind. I’m not the biggest fan of matsutake but I thought the marriage of the sea and mountain worked well here. It was again a very subtle dish with little salt. I imagine this could divide opinions between the salt loving Kanto people and the Kansai people of Japan. 4th Course – Sea bream sashimi from Awaji-shima (淡路島の鯛の刺身): An extremely delicate dish with a variety of options to go with the sashimi. There was either salt and sudachi juice or soy with a dash of mirin. 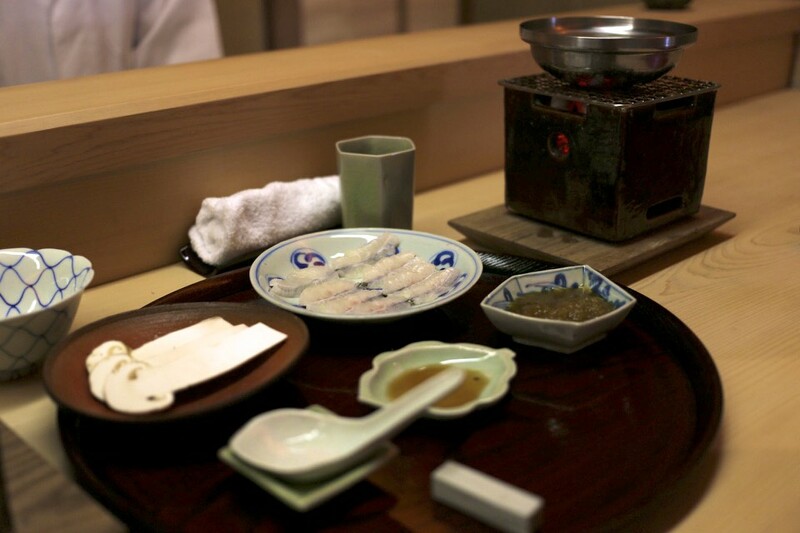 I personally preferred the salt and sudachi as I could distinctly taste the flavour of the fish better than with soy. 5th Course – Thawed Squid and its liver / Surumeika no kimo no rui-be (スルメイカの肝のルイベ): A meal at Matsukawa certainly showcases some of the more rare types of Japanese dishes. Dishes that foreigners may not otherwise be exposed to. 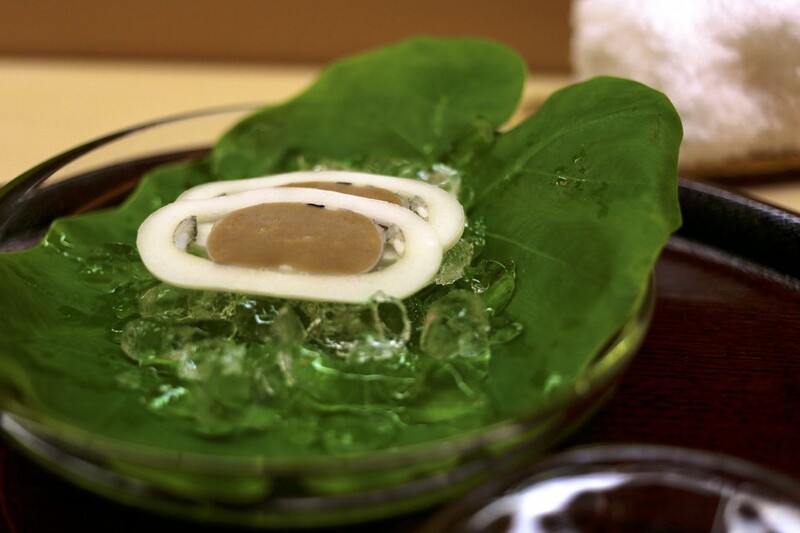 A rui-be is a typical style of dish that originated from the Ainu people of Northern Japan where they thawed food that had been preserved at -20 degrees celcius. The squid and its liver literally melted in your mouth as soon as it touched your tongue. It was not too dissimilar to foie gras in terms of texture. I wasn’t quite convinced with the flavour here but loved the texture. 6th Course – Steamed sea urchin and lotus root / Uni to renkon no hasumushi (海胆と蓮根の蓮蒸し): We moved slightly south to Ishikawa prefecture for the next dish of the hasumushi. In this dish grated lotus root was steamed and covered with a thick broth. In this instance Chef Matsukawa also added slivers of deliciously melting sea urchin to the grated and crunchy lotus roots. This was yet another delicate dish that celebrated the superior quality of the best ingredients one could get their hands on. We could see and smell over the counter the next course… 7th Course – Sweetfish with water pepper vinegar sauce / Ko-ayu tadezu (子鮎 蓼酢): The yakimono (grilled) course was sweetfish (ayu) that had been grilled over white charcoal (binchotan), served with an alkaline base sauce made from a water pepper (tade) that grows by the river where the sweetfish swims. The addition of the sauce cut down the heat of the vegetable and cut through the acidity of the fish. This was easily the best ayu fish we had on our trip, and by quite some distance. 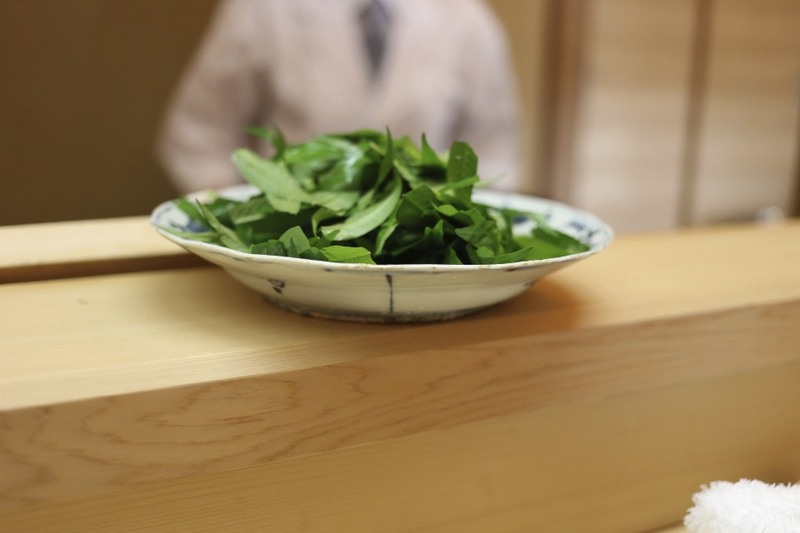 Curious to know what water pepper looks like Chef Matsukawa presented a bowl of it. 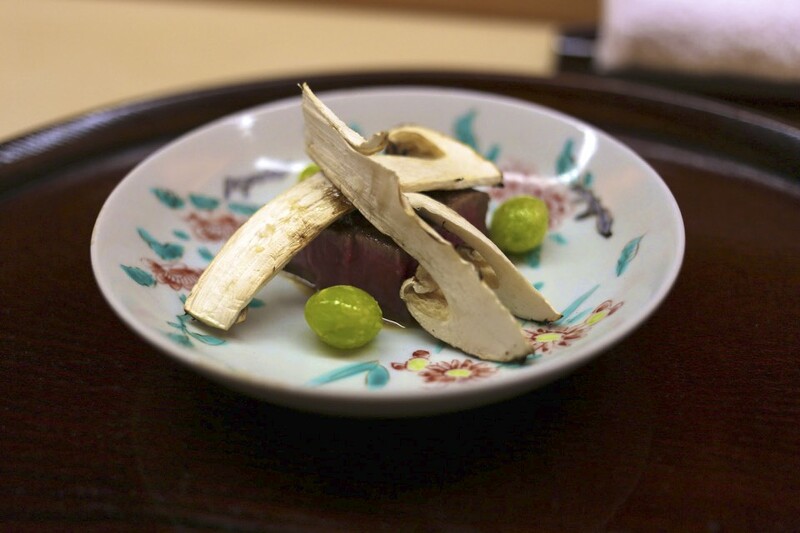 8th Course – Ōmi beef and matsutake: A slice of beef from Ōmi served with matsutake and ginnan. The meat was rather pleasant and not too fatty. Whilst this was the only meat dish of the meal, the quality of the meat more than made up for it. I wasn’t really sure whether the matsutake was necessary here other than to bump up the price of the menu. 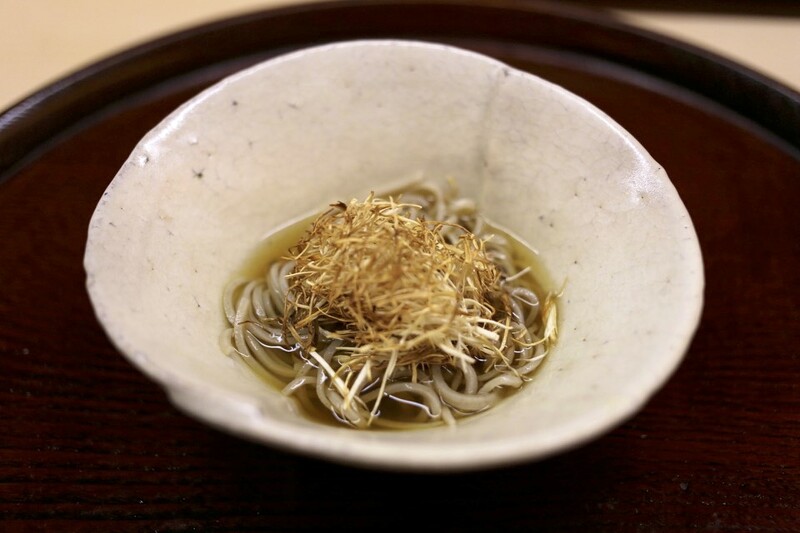 9th Course – House Soba with grilled and shredded crispy matsutake: In comparison to the previous dish, I rather enjoyed this preparation of the matsutake. The matsutake’s crispy texture was a nice contrast to the firm noodles. 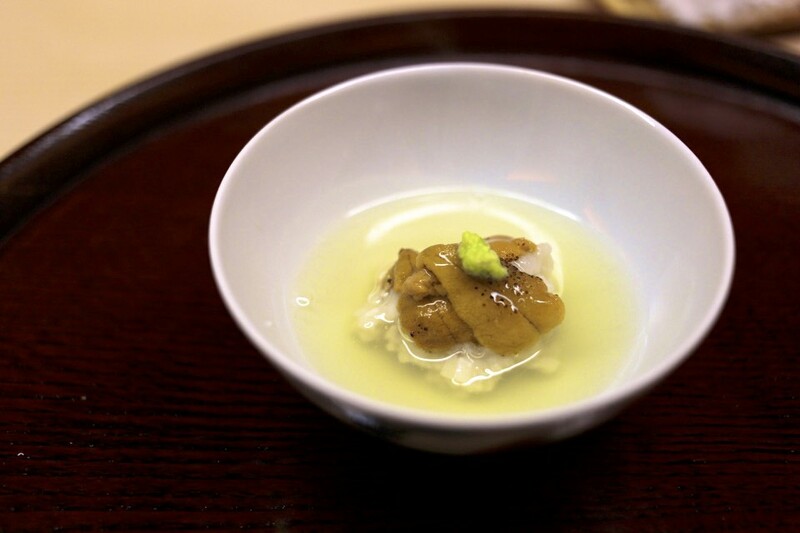 The tsuyu or the sauce was well balanced and did not overpower the mushroom. For the next course the binchotan was brought to us over the counter and we were in for another treat… 10th Course – Shabu shabu of conger pike and matsutake / Hamo to matsutake no shabu shabu (鱧と松茸のしゃぶしゃぶ): I was left speechless with this dish. 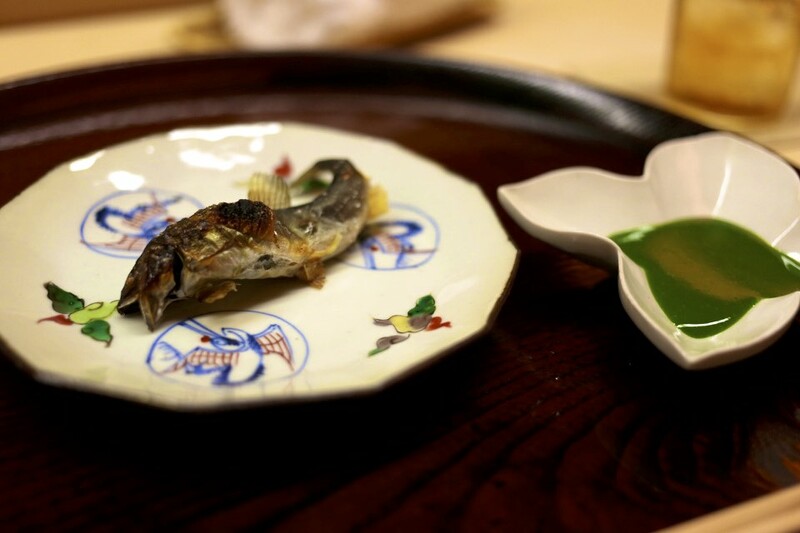 The dashi made from the bones of the hamo (conger pike) had an amazing flavour like nothing I had ever tried before. Given the bone of the hamo are so small to the point where breaking them without piercing the skin is considered an advanced skill, I was amazed so much flavour could be drawn out of them. Unlike some of the hamo that we had tasted on our trip, I could really taste the natural flavour here due to the minimal interference in the preparation of the fish. There was also the generous slices of matsutake which was perfect to soak that deep and rich dashi. Wow. Simply, wow. 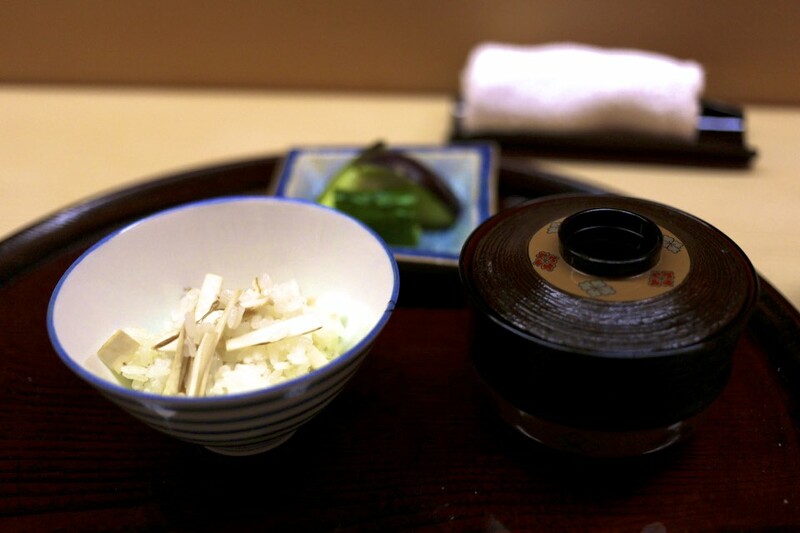 11th Course – Matsutake rice: To finish off the savory segment we were brought a bowl containing raw slices of matsutake over rice served with pickles and miso soup with matsutake. The matsutake had a slight crunch and was again very subtle in flavour with minimal intervention. It gave us some time to reflect on the meal we had just experienced (and also fear what the price tag was going to be!). This was most definitely the best kaiseki meal I have ever had the joy of eating. 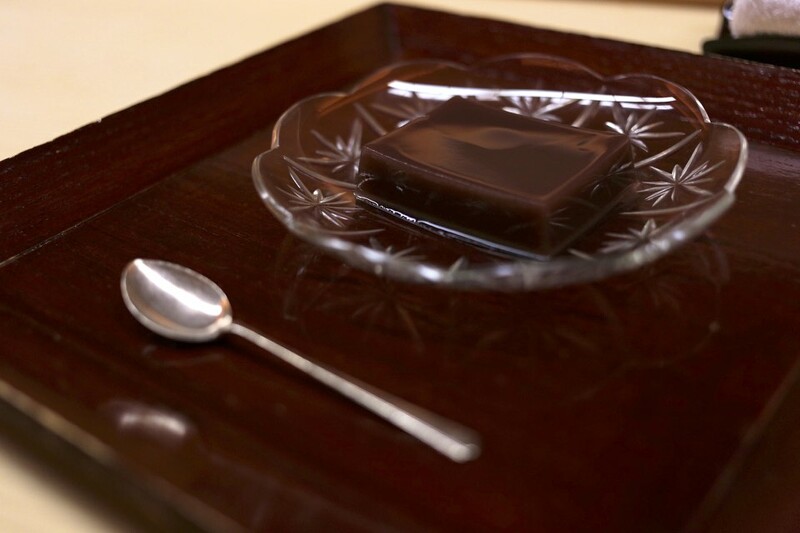 12th Course – Red bean jelly / Youkan (羊羹): Even the youkan was superb! It was not sickeningly sweet and had a very silky texture to the point where it was borderline liquid. I’ve always had them quite solid and quite sweet. I didn’t know it could get this good. I certainly couldn’t go back to the other ones after this. I was ruined. 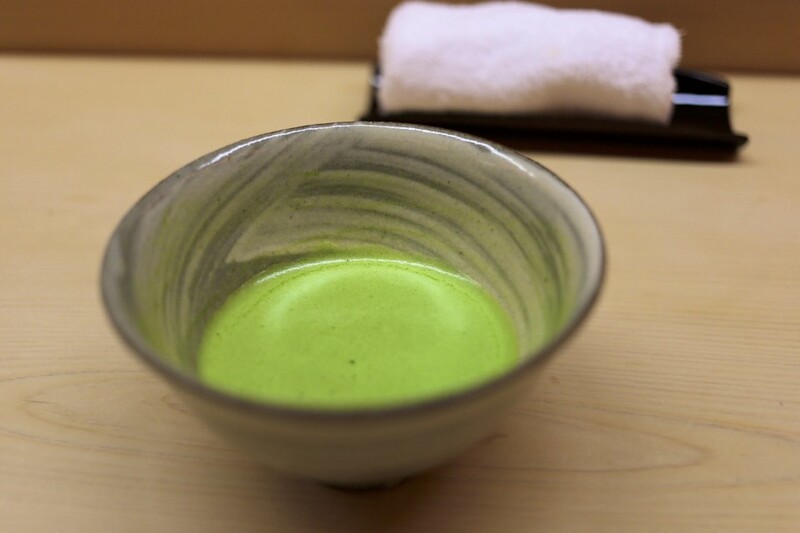 Glass of green tea (matcha) to finish off. My friend and I literally scrounged around for the last 500 yen coin as we had not anticipated our bill to come to an eye watering 87,200 yen between the two of us (including one small beer), making this the officially most expensive meal on our trip as far as food went. However, if you asked me then or now if I would return, I would say yes in a heart beat. The food here was really mind blowingly good and was on another level to anything I have previously tried in Japan. What’s more, it ridiculed the three starred kaiseki we had the day before in Kichisen on every front staring with produce, to the cooking and service. 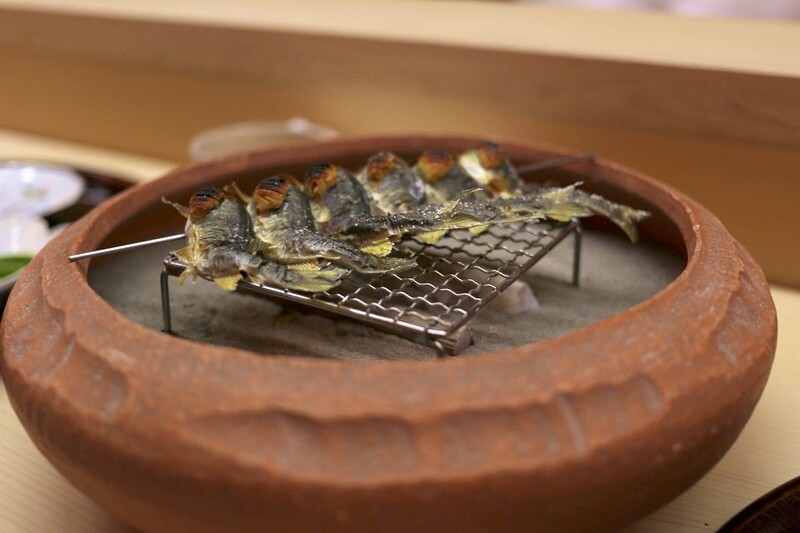 Chef Matsukawa’s eye for the perfect ingredient and produce is equally impressive as his skills in handling them. What’s more, what I really like about him was his quiet confidence in his own skills which has rewarded him with his faithful clientele. I had some hesitation writing this review because it is clear that he’s not after publicity or fame. Judging by the demeanor of some of the other diners, most of his customers are equally coming in to enjoy a delicious but low key meal. I hope it stays this way. This entry was posted in Japan and tagged Hamo, ise-ebi, Japan, Kaiseki, Matsukawa, matsutake, Tadayoshi Matsukawa, Tokyo on February 3, 2016 by admin.